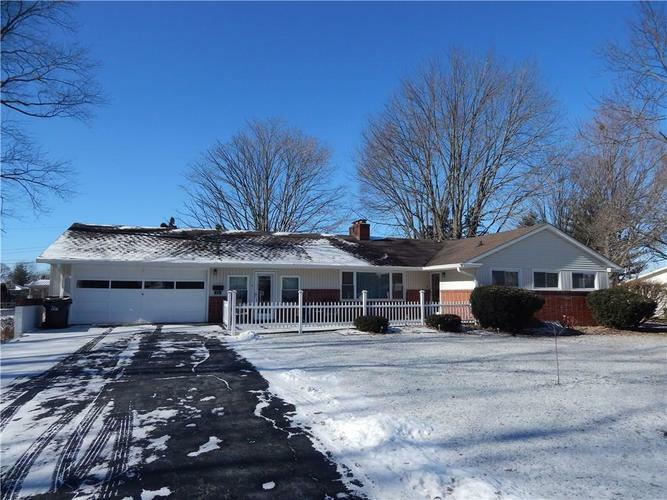 1542 SF Ranch w/ Full Bsmt in Quiet Neighborhood close to hospital, schools, & shopping! .4/Acre Lot w/ Mature Trees & Extra Parking Besides Driveway! Updtd Master Bath! Newer Energy Efficient Windows! Hardwood Flooring Under Carpet - in main house (not FR)! Two-sided fireplace between Living Rm & Dining/Office Area! Original Woodwork! Kitchen w/ Updated Cabinetry & Newer Fridge & Gas Stove! Washer & Dryer in Bsmt will Remain! Gas Frplc in Bsmt Also! Seller will connect freestanding heater in Breezeway/Family Rm. Directions:I-70 to Hwy 9/Greenfield exit. Go south on Hwy 9 to Boyd (Stoplight by Hospital). Go west to 3-way stop. Go left & follow around curve to Redbud. Turn left (south) to Hm on west side (Backs up to church).